Two former Strikeforce champions, Marloes Coenen and Cris Cyborg, collide with the inaugural Invicta featherweight title on the line. 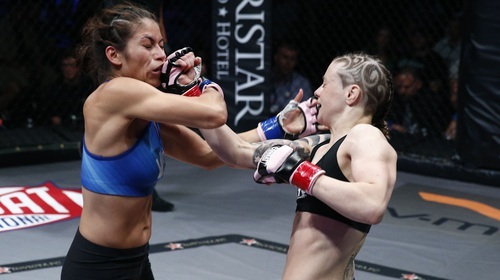 The pair had met in 2010, with Cyborg’s strength winning the day, but Coenen was determined to avenge that defeat at the Ameristar Casino, Kansas City. 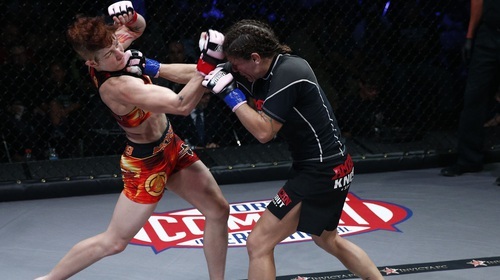 Invicta 6 also featured a stacked undercard including the US debut of Nova União sensation Cláudia Gadelha. Claudia Gadelha vs. Ayaka Hamasaki Invicta FC 6 Jul 13, 2013 (25:27) Representing Brazil, Claudia Gadelha, on the cusp of a title shot and undefeated at 10-0 is up against Ayaka Hamasaki, a black belt in judo and also not ready for her first loss. Watch Gadelha in the first ever strawweight fight in UFC history at UFC Fight Night: Cerrone vs. Miller, exclusively on the UFC FIGHT PASS Prelims on 07/16/2014 at 6:30PM/3:30PM ETPT. Lauren Taylor vs. Sarah D'Alelio Invicta FC 6 Jul 13, 2013 (26:19) After winning her first six fights, five of them by TKO, Lauren Taylor plans to keep her unbeaten streak alive in this bantamweight bout against Sarah D'Alelio, a slight favorite in the fight. Leslie Smith vs. Jennifer Maia Invicta FC 6 Jul 13, 2013 (25:15) Jennifer Maia, a top Brazilian prospect with excellent striking, is one win away from the Invicta FC flyweight title shot, but Leslie Smith, a moving down to 125 pounds, hopes to spoil her night. Joanne Calderwood vs. Norma Rueda Center Invicta FC 6 Jul 13, 2013 (24:50) Norma Rueda Center makes her Invicta FC debut on short notice replacing an injured fighter to take on Joanne Calderwood, a very decorated muay thai fighter with a 19-2 professional record. 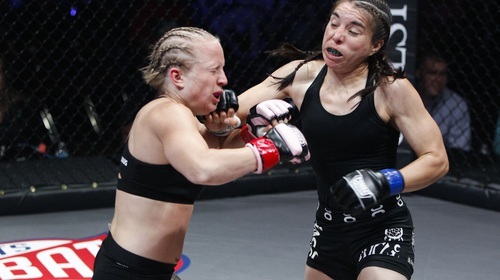 Mizuki Inoue vs. Bec Hyatt Invicta FC 6 Jul 13, 2013 (24:46) One of the most skilled technical female strikers, Mizuki Inoue enters the Invicta FC cage for the first time to face veteran Bec Hyatt, who is a fan favorite and coming off a huge win at Invicta FC 5. Miriam Nakamoto vs. Duda Yankovich Invicta FC 6 Jul 13, 2013 (10:38) Duda Yankovich transitioned into MMA after a boxing career in Europe, who is looking for her second career win, but Miriam Nakamoto, who is rebounding after a no contest due to illegal knee strikes, has the same plans. Emily Kagan vs. Ashley Cummins Invicta FC 6 Jul 13, 2013 (25:28) Coming off a loss at her Invicta FC debut, Emily Kagan wants to get back on track with a huge win against Ashley "Smashley" Cummins, a full time police officer in St. Louis. Jessica Penne vs. Nicdali Rivera-Calanoc Invicta FC 6 Jul 13, 2013 (11:48) Nicdali Rivera-Calanoc faces her toughest opponent to date in the first Invicta FC atomweight champion, Jessica Penne, one of the most rounded female fighters with her fights ending in submissions and TKOs alike. Livia Von Plettenberg vs. Kathina Catron Invicta FC 6 Jul 13, 2013 (24:18) Kathina Catron takes this fight on less than 24 hours notice against Livia Von Plettenberg, who came in 8 pounds over weight in this flyweight bout at Invicta FC 6.